Some books you know right away you love, and some you come to love over time. This book is both – Bulawayo’s prose is immediately arresting and her characters and literary voice stays with you long after you’ve finished. Remarkable read! A remarkable literary debut--shortlisted for the Man Booker Prize! The unflinching and powerful story of a young girl's journey out of Zimbabwe and to America. NoViolet's story "Hitting Budapest," the opening chapter of the novel, won the 2011 Caine Prize for African Writing. 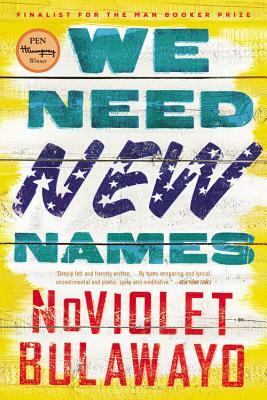 NoViolet's other work has been shortlisted for the 2009 SA PEN Studzinsi Award, and has appeared in Callaloo, The Boston Review, Newsweek, and The Warwick Review, as well as in anthologies in Zimbabwe, South Africa and the UK. NoViolet recently earned her MFA at Cornell University, where her work has been recognized with a Truman Capote Fellowship. She will be attending Stanford in the fall as a Wallace Stegner Fellow for 2012-2014. NoViolet was born and raised in Zimbabwe.